The ultra muted Trigger 27.5 Carbon Black Inc comes spec’s to kill with SRAM XX1, Enve carbon wheels and a RockShox Reverb Steath dropper post. 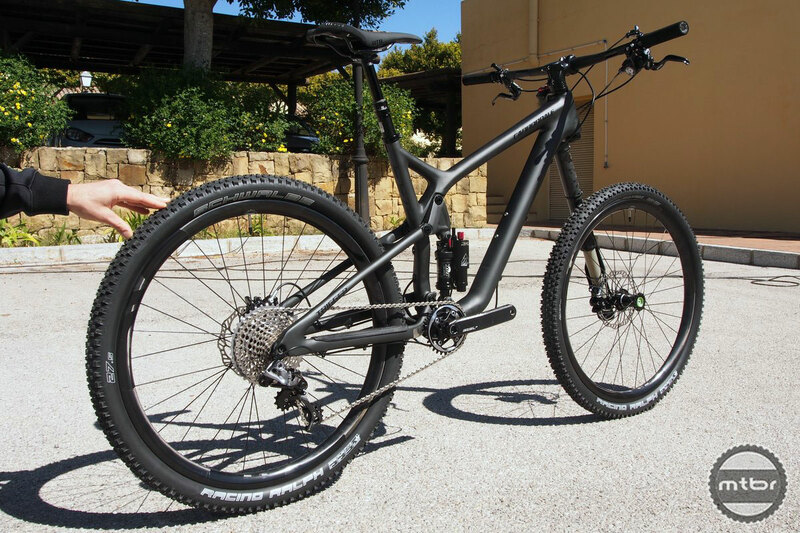 Cannondale has unveiled an updated 27.5-inch wheel version of their Trigger trail bike that includes a new 140mm-travel Lefty SuperMax fork, and a new iteration of their adjustable FOX-built DYAD rear shock that adjusts to either 85 or 140mm of travel via a handlebar remote. 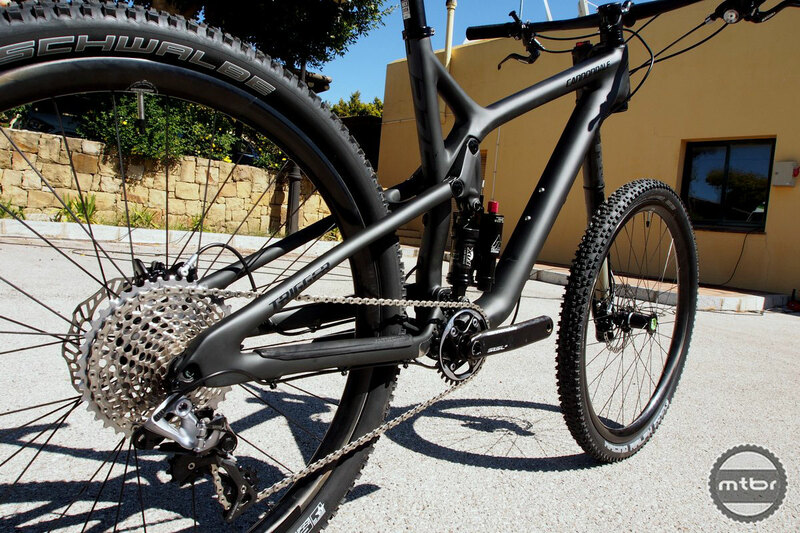 The Trigger 27.5 will come in three carbon and two aluminum versions, including the top-of-the-line Carbon Black Inc spec’d with a SRAM XX1 1×11 drivetrain and Enve carbon wheels. The Trigger’s geometry has been relaxed slightly from prior models with the head tube angle slackening to 68 degrees and the seat angle 73.5 degrees. Video: Cannondale team riders Mark Weir and Jerome Clementz helped dial-in the geometry and suspension of the new Trigger 27.5. 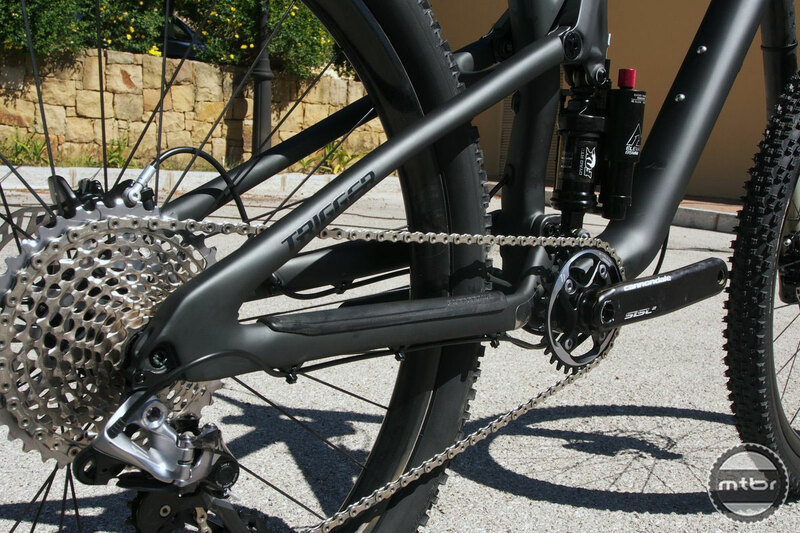 The jointly-developed FOX/Cannondale DYAD shock at the heart of the Trigger’s suspension features a two-chambers design essentially giving a different shock to each mode—Elevate Mode for climbing and pedal sections, and Flow Mode for descending. The DYAD shock’s two-in-one design uses separate chambers for climbing and descending. 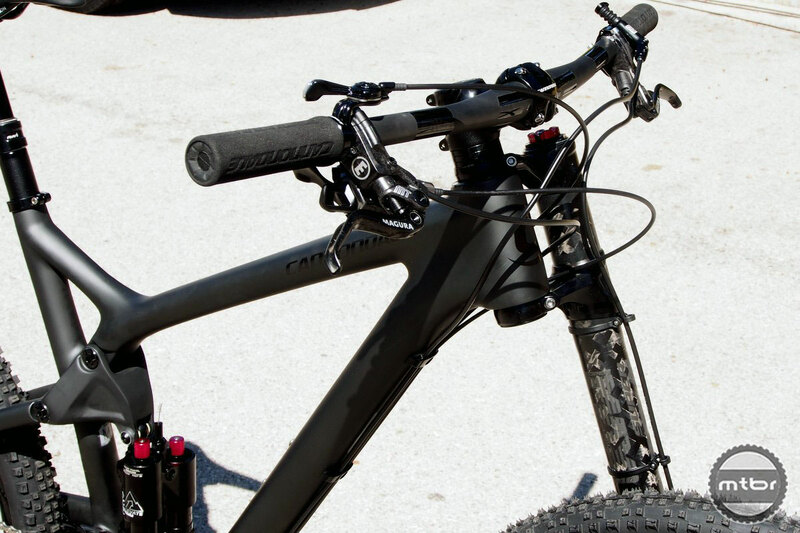 Cannondale optimized the Elevate Mode damping circuit for climbing and rolling terrain by reducing the air spring volume and giving it a steep, progressive rate. This creates a snappy, efficient pedaling feel and allows for fluid movement through the first part of the stroke improving both traction and small bump compliance. By moving the long travel damping to a separate circuit—the Flow Mode circuit described below—Cannondale says they can use spring rate to control unwanted suspension movement, rather than extra compression damping like traditional shocks. Thus climbing performance is improved without sacrificing traction and comfort, unlike other pedaling platform modes. With the DYAD set on Flow, the shock opens an additional, larger circuit, adding its air and oil capacity to the equation. As the air volume increases, the Flow circuit also changes the spring rate to be more liner and coil spring-like. This gives the Trigger a more supple feel on bigger hits as well as a progressive rate near the end of the stroke for a confident, bottomless feel. Since damping duties for other types of terrain are handled by the Elevate circuits, the Flow circuits are optimized specifically around the needs of high speed, aggressive descending, according to the company. The Trigger runs in Flow mode by default, but can be toggled in and out of Elevate mode by pushing its remote lever. Though it would add another cable, we wouldn’t mind seeing the remote control both the DYAD and the Pop Loc soft lockout on the fork simultaneously. A handlebar remote lets riders change shock modes on-the-fly. On the trail, the system seems quite effective. In Elevate mode, the bike rises up in the sag, increasing the effective bottom bracket height and steepening the head angle a bit. Though it has less travel and ramps-up faster, the suspension is still fully-active giving it good traction on technical climbs. 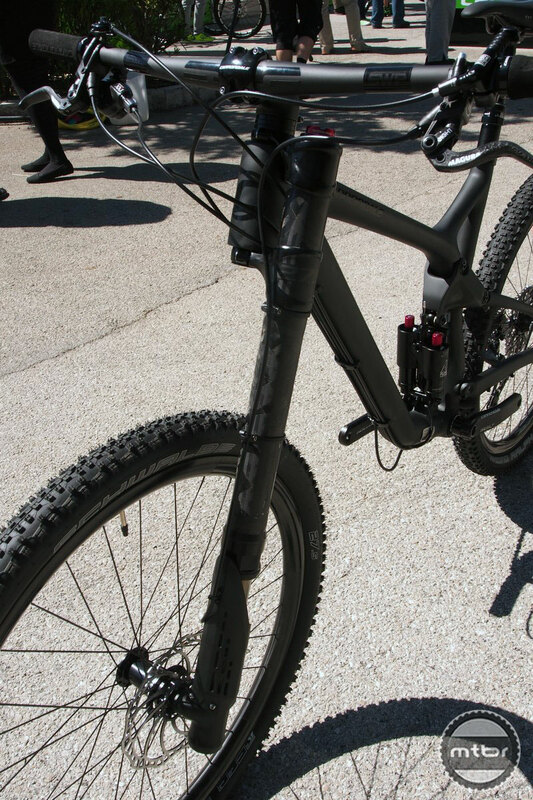 It also reduces pedal-induced bob and makes the bike is more responsive to pedaling input. With the rider more upright pedaling efficiency is better on steep climbs. Video: Mountain biking’s fastest couple, Jerome Clementz and Pauline Diefenthaier ride their Triggers in a Patagonian adventure. 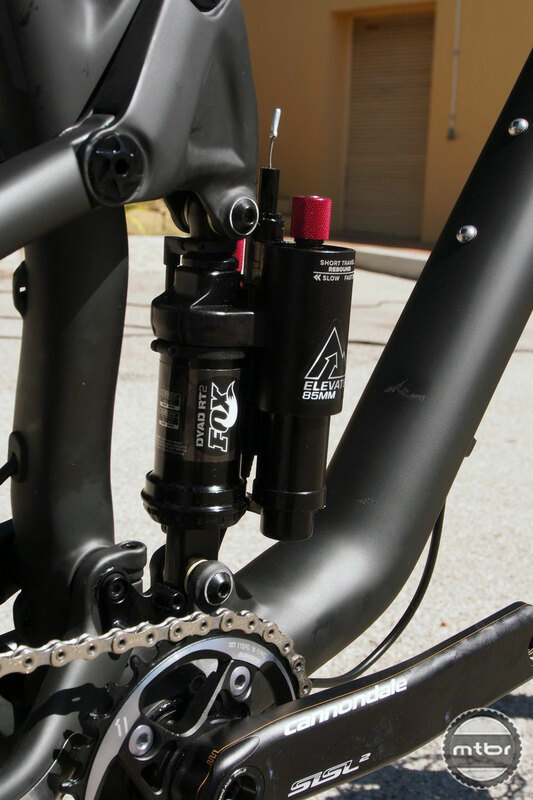 Perhaps the most distinctive—and divisive—element to the Trigger is its single-sided Lefty suspension fork. The latest version dubbed features an inverted 36mm stanchion sliding within a 46mm outer leg the company claims as incredibly strong and laterally stiff. The four-pound, 140m-travel fork glides on a set of needle bearings for a smooth, stiction-free action even under high braking and cornering loads. The aforementioned Pop Loc soft lockout is mounted on the top of the leg as it was on prior models. 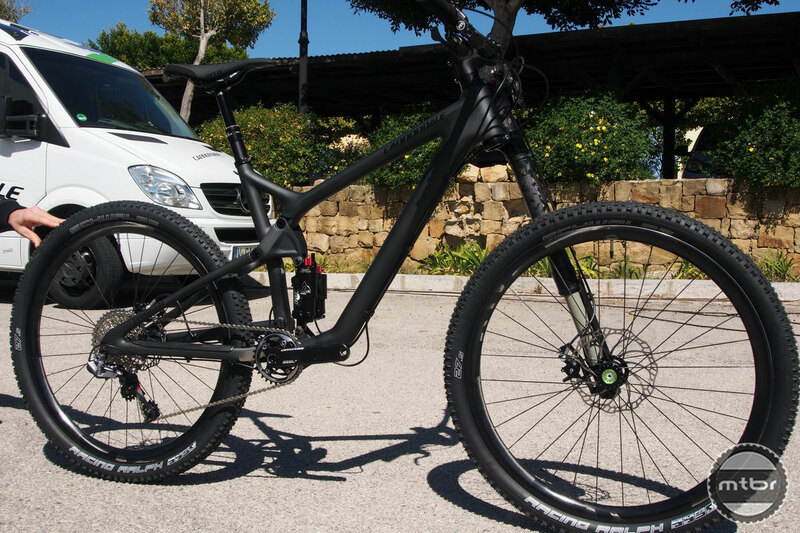 The Lefty SuperMax also comes in 160mm of travel on the new Cannondale Jekyll. 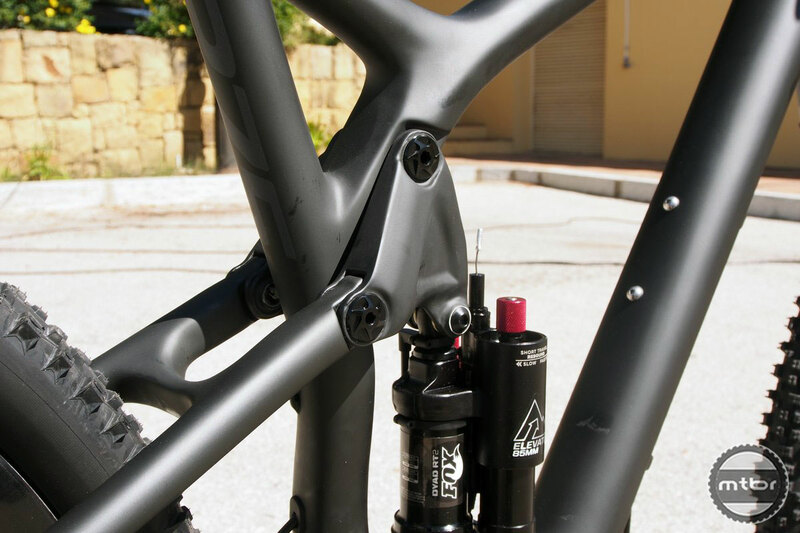 And while Cannondale is fully committed to the Lefty platform, the Trigger can now be fitted with a standard, two-legged fork, letting riders easily opt out of the proprietary system if desired. In fact, some of the Trigger models now come spec’d with standard Fox forks. In either case, the ability to swap to a new model fork, or swap out the Lefty for servicing is a welcome change to the trigger platform. 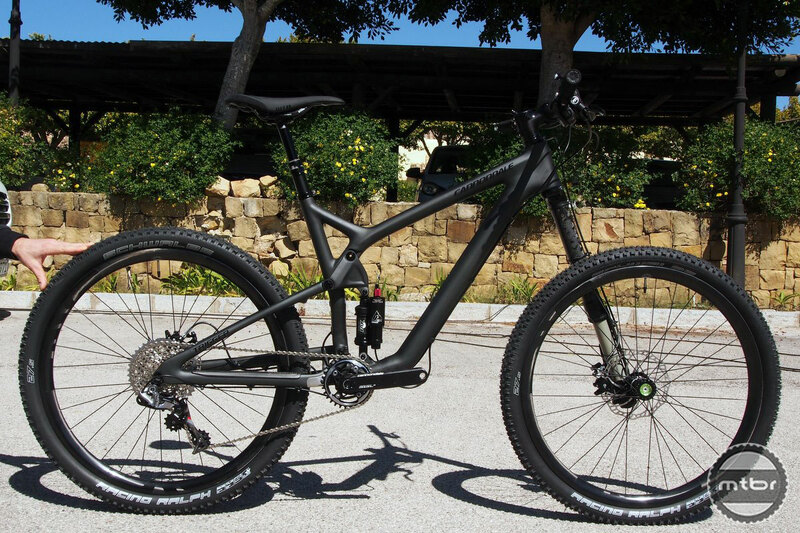 Pricing and availability of the new Trigger 27.5 has not yet been finalized, but the company expects the bike to hit shop floors in June, 2014. For more information visit www.cannondale.com. The lefty fork should go to the museum! Step up the game and start using real forks! Since Lefty is 13 years old and regular forks are around 25, if Leftys go to a museum then Rock Shox, Fox, Manitou and the rest shoud be dug out my an archaeologist from a mid-mest native american site. One might say that about conventional forks. They’ve been around forever. You ever ride a lefty? What problem did you have with it? Have you tried one? You might change your mind. Why do these always turn into love hate discussions about leftys? I’ve had a lefty on my Niner Air9 for over 2 years now and think it’s a great performer, i.e. it works as a front suspension. However, I’m not emotionally attached to it as other lefty folks are and hate fielding questions about it. Most of the objections seem to be based on “it’s different and I don’t understand.” I also “debadged” the decals so it is all black and it looks much better. I wish the lefty was a little more tunable and had more stuff on the inside with cool acronyms. I wonder what an actual susp company could do with similar design and what would they call it (e.g. RockShox Peggy)? This was the bike I was waiting for Cannondale to build. Unfortunately, I went with an SC and I’m loving it. I may eventually go back to Cannondale. On the Lefty, I’ve used all kinds of forks from all kinds of makers and the Lefty performs the best. On the negative side, the maintenance required is more than I care for but not enough of a detraction to keep me from getting one again. Supposedly, the newest version of the Lefty remedies some of that but I have no experience with it. It seems like a logical next step in the evolution of Trigger to have it made in a 27,5 guise. Maxed out like this, I bet it’s a great ride… and very expensive. As for the Lefty – I am using one on my current bike and in my oppinion it’s the best thing out there. I am especially impresed by it’s stifness, which makes the steering all that more precise. My only gripes with it are that tools are required to take the front wheel off and – obviously – the price. But as always, good things rarely come cheap. I’d like to see one of these in 160mm mode compared to a Pike, a Bos, an X-Fusion Vengeance, and a Fox 34. In a comparison test that doesn’t just say they’re all wonderful and the best thing since sliced bread.